One of this year’s hosts for the Stanford LEAD program’s Me2We event was the DuPont Silicon Valley Innovation Center – home to four labs designed to enable real-time collaboration, prototyping, testing, and iterative design. 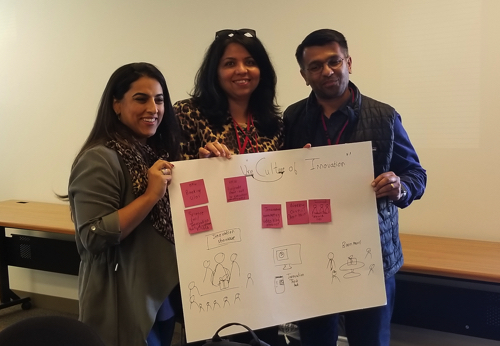 Having collaborated closely with the Innovation Center on exciting and innovative projects, 219 Design was invited to lead an interactive workshop about our product development process, including the best ways to overcome innovation challenges. We hope you find these best practices as useful as we do. Me2We is an annual three-day student-led event that brings Stanford LEAD program participants and a diverse group of thought leaders, experts, researchers, authors, and Stanford GSB faculty together from all over the world. Priya is a UX and New Concept Development Consultant. She works closely with 219 Design on projects and presentations that require her specialized knowledge. She thrives on combining the human-centered design process with business strategy to achieve innovative solutions. 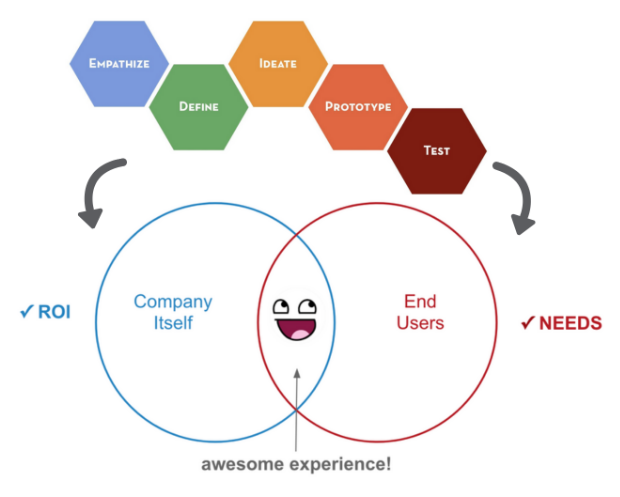 #1: Apply design thinking to both your end users AND your company to find the best overlap between user needs and ROI. We often think of design thinking as a process to better understand our end users, but this process can and should also be used to understand our own companies. Empathizing with your internal stakeholders’ views and understanding your company goals lead to initiatives that both your company and your customers will fully embrace. #2: Expand your company’s mindsets to stimulate more creativity on a daily basis. Is your company laser-focused on maintaining existing processes? Maybe you have a strict development environment? Do various departments need to come together on a clear vision? True innovation requires empathy, diversity, radical collaboration, and experimentation. 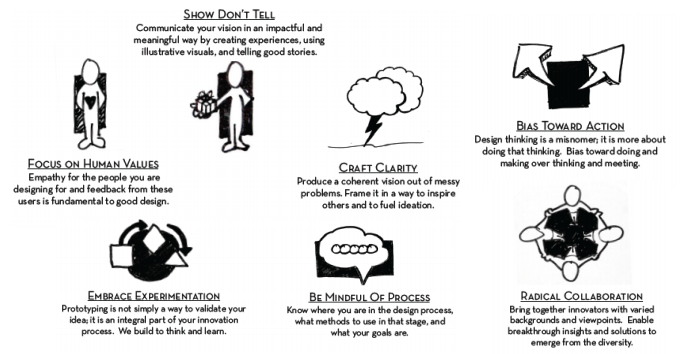 Start incorporating the following design mindsets into your company’s culture to move beyond the traditional and begin thinking in new, innovative ways. #3: Get physical early in the process. Talking about something again and again but not moving forward? Grab some markers, large sheets of paper, post-its, etc. and start actively brainstorming together. Or, grab a few supplies you have handy – clay, blocks, popsicle sticks, pipe cleaners, foam core, cardstock, etc. and create visual, low-fidelity representations of ideas you might be exploring. Using your hands can open up more creative and productive parts of the brain and get you and your team really innovating to help you build the right thing. #4: Make sure you can build the thing RIGHT. Once human-centered design has helped us understand the right thing to build, it’s time to figure out how to build the thing right. Compare your engineering team’s skillset with the project requirements to see if you have any skill gaps to fill. Make sure your team is knowledgeable about the latest technology, which could exist outside your industry. Make sure your team has the bandwidth to meet your deadlines – time to market can be critical. #5: Finally, get help if you need it. Your company is great at doing what you do. When you want to do something new, there’s no harm in reaching out to a firm with different experience and expertise. If you find that you could use some additional skills, knowledge, resources, or perspective – reach out to 219 Design. Our value goes beyond expert product development. We’re in the business of helping our clients achieve success. Our approach, our passion, and our versatility show in our results. With 219 Design, you get a true development partner that is in it for the long run.